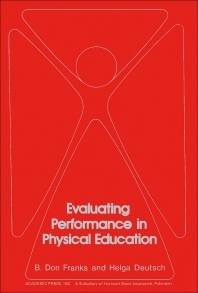 Evaluating Performance in Physical Education describes the tools and techniques that can be used by teachers to assess student performance, curriculum, and method of teaching. The book discusses conventional material in evaluating physical education performance through written, fitness tests, and elementary statistics. The text also explains nonparametric statistics, subjective evaluation, and a theoretical model for fitness and performance. The authors review the functions, evaluation, and administration of testing. The authors also explain in more detail subjective evaluation and offer three forms: 1) experience of the teacher; 2) skill to be rated; and 3) length of time for rating. In testing events, nonparametric statistical procedures show more reliability; parametric procedures are preferably to be used in established research stations. The authors also list some guidelines to be followed in evaluating the student such as objectives, assignment of grades, and acceptance of the grading plan. The book also discusses procedures when evaluation involves large groups. The text can assist physical education teachers, school administrators, and educators in evaluating their subject course or curricula.